We live in a world where so many have decided that the church has lost its way. Many have taken their exit and many continue to struggle to find some level of hope and truth for the people of God. Waves of “seeker-sensitive,” “purpose-driven” and “relevant” churches have changed the perspective of ministry from teaching and preaching the gospel to conform to the American business model of success. So how was I to reconcile the fact that I was now pastoring thousands of people with the fact that my greatest example in ministry was known for turning away thousands of people? In a small meeting room on deck 5, a group of Federation officers take some time away from their important duties onboard the Starship Enterprise to reflect on something more infinite than space itself. The group has been working through the Gospel of Mark and all the while reflecting on the sufficiency of grace and the role of Christ in his universal plan of salvation. ghaH nge’pu’DI’ pe’tlhoS , ghaH qunchoH. Printed on recycled paper, using soy-based ink with a cotton/linen cover, the Green Bible is the project by HarperCollins to bring environmental responsibility and the teaching of Scripture in to one beautiful package. 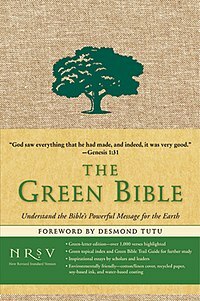 Within the text of this edition of the NRSV, verses that are about the earth and the environment are printed in green ink to highlight the Bible’s comments on taking care of the planet. Yet under this cover is a message that arguably undercuts aspects of the overall message of the Word of God. What’s the harm in putting two good concepts together, you may ask? Should Christians not be concerned about the environment, it being God’s creation and all?